We are proud today to launch GuideConnect, our new talking digital assistant for blind and partially-sighted people. GuideConnect will enable you to easily and independently send emails, enjoy books and newspapers, listen to the radio and access websites. This simple talking technology has been thoughtfully designed by and for people with sight loss, and is ideal for those who are new to technology or who simply lack confidence. Using GuideConnect, you can increase your independence and also feel closer to your family, friends and the wider community. GuideConnect can help you browse online, scan and read post, manage everyday tasks and just have fun! 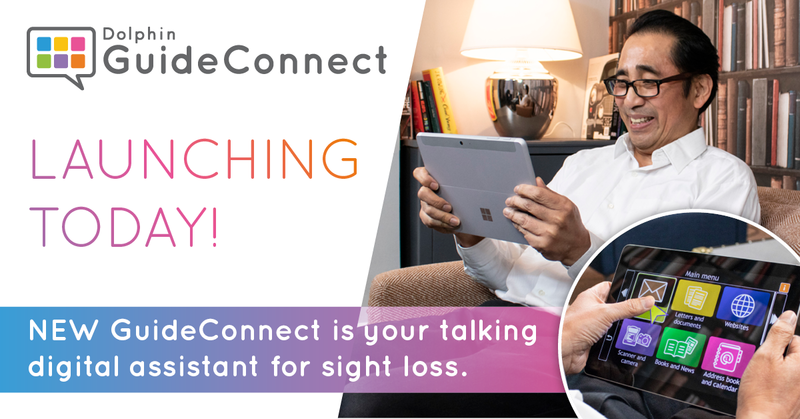 • If you already own a Windows tablet, laptop or desktop, try GuideConnect free for 30 days. • Choose GuideConnect on our tablet package for the easiest touchscreen navigation. • With simple mouse and keyboard control, opt for GuideConnect on our laptop and desktop packages. • Enjoy GuideConnect on the largest screen in the house with the best audio, using our tactile remote with your TV. You can download a free trial today and then get started in no time at all. GuideConnect talks you through every step, with straightforward menus, help on every page and free telephone training. Noel Duffy, CEO of Dolphin, said “we are delighted to launch GuideConnect, our latest solution to empower people with a visual impairment. Losing your sight can be a devastating, isolating process. Technology is a great tool to increase independence, but can seem intimidating. Our simple talking technology enables blind and partially sighted people to do everyday tasks easily, exactly as a person with full sight would”. Find out more information about Dolphin’s GuideConnect.